The minutes of the 2017 WSFS Business Meeting (all 123 pages of it) are now online from the WSFS Rules web page under the MINUTES heading. The head table staff were (left to right) Donald Eastlake III (Parliamentarian/Deputy), Linda Deneroff (Secretary), Kevin Standlee (Chair), and Paul Dormer (Timekeeper). Not pictured but definitely part of the team was Lisa Hayes (Videographer). 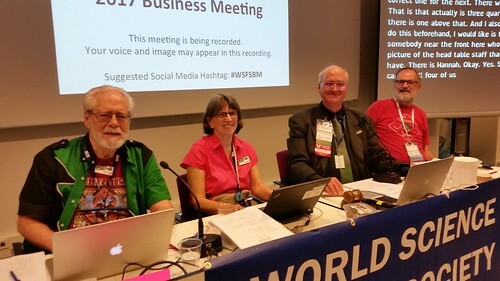 The 2018 Constitution, Standing Rules, Resolutions & Rulings of Continuing Effect, and Business Passed on to the 2018 Worldcon are still being prepared and will be published when they are completed. My great thanks to Linda Deneroff for the massive amount of work she did compiling these minutes.